Merhaba! Ok…so I’m not currently in Istanbul but this recipe will take you straight to my beloved Turkey. Aside from viewing the stunning historic sites and touring Constantinople on my 2012 trip, exploring the local cuisine was one of my favorite parts of the visit. During this vacation, my friends and I took a cooking class at a local school/restaurant (Cooking Alaturka) where we prepared and served several dishes to the patrons including these fabulous zucchini blinis. I’ve made and enjoyed them several times since then and let me tell you, zucchini has never tasted so good!! Give them a try! I hope you enjoy. Remove the herbs from their stems and chop them together as fine as you can. Cut the zucchini lengthwise and remove the bulk of the seeds by either using a knife or spoon. Be careful not to take out too much as this will make the zucchini thin and difficult to grate. Using a medium grater, hold the zucchini at a 45 degree angle and grate into long strips. Squeeze any excess water out of the zucchini if necessary. Chop the green onions thinly using both the green and white parts. In a large bowl, beat the eggs and flour to create a smooth batter. Add the cheese, herbs, red pepper, zucchini and green onions. Season with salt and pepper and stir to combine the ingredients. Let the batter rest for 10 minutes. Meanwhile, crush the garlic into a paste using a mortar and pestle. If you don’t have one, you can use the flat end of the knife to do this also. Smash the garlic, sprinkle with coarse salt and drag the flat end of the knife over the garlic several times until you have smooth paste. In a small bowl, combine the garlic paste and yogurt. Heat a small amount of oil in the frying pan; just enough to cover the base of the pan. Ladle ¼ cup of batter into the oil; repeat this 3 or 4 times or until you pan is full. 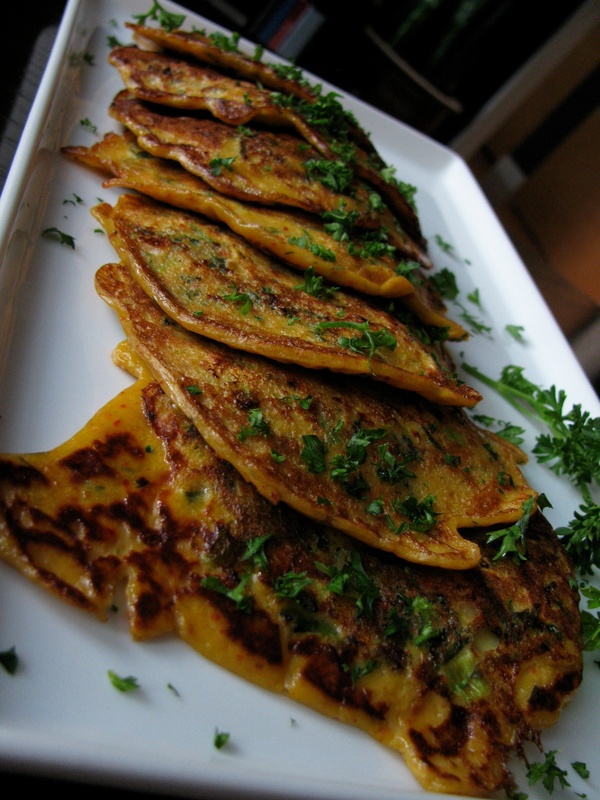 Fry the blinis approximately 3 minutes on each side or until they’re golden brown. Serve the blinis hot with a dollop of garlic yogurt. These make a great side dish to pan seared or baked chicken. Change it up! Add ½ cup of diced ham or bacon for a tasty meaty treat. Swap out the potato and Parmesan or try beets and blue cheese instead. Photo copyright by Alex Corzo. That sounds amazing. I really need to try this recipe. Wow!! This looks delicious. Can’t wait to try it.